Our heavy-duty custom square and rectangle shaped mesh tarps are the perfect solution for sunny days. UV-resistant mesh gives you shade on the hottest days to keep you cool. Mesh tarps are great for covered areas all year long! Wind passes through our custom mesh tarps, so they're ideal for privacy screens. Close-knit mesh keeps out prying eyes without the hassles of taking down tarps on windy days. Mesh tarps look great on a chain-link fence for extra privacy. Every Covers and All mesh tarp comes with a two-year guarantee, so you know it's high quality. 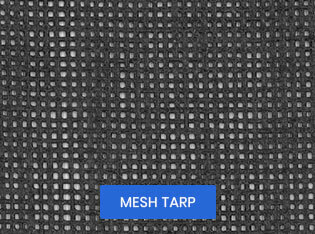 Mesh tarps are abrasion-resistant, mildew-resistant, and sewn with triple-thick hems. Order a square or rectangular mesh tarp and keep the sunshine off your back for years to come! Heavy duty tasks in Construction, Trucking, Manufacturing, Landscaping, Nursery Jobs etc. Perfect for shade, privacy, or drainage. Highly abrasion resistant, UV resistant, Mildew resistant, Triple thickness hems, Same color on both sides.